Become climate smart with Josefin. 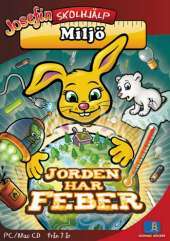 In Josefin School Help, the earth has a fever, the little rabbit must fight to make the globe healthier. Josefin's extraterrestrial friend Fredo, has observed the earth from space and it looks anything but good. Although Josefin cannot do everything for our soil, it is important that she, like everyone else, contributes to a cleaner world and a healthier environment. The player learns about environment, energy and climate issues through assignments and facts gathered in a dictionary. The game, like the other Josefin games, is aimed at younger children of school age. Features: Lots of important information about the environment and climate that is gathered in a dictionary; Today's assignment, which is something you can easily do at home in your neighborhood; Save polar bear cubs at the North Pole; Prevent bulldozer drivers in the Amazon; Plant new trees in the Sahara Desert; Leave lights in skyscrapers and save power; Help to recycle debris in China; Easy-to-understand information about the greenhouse effect; Collect material to make Josefin's house climate-smart.